Just after the report that Amazon is looking to launch a Zombieland web series, news comes that leads have been cast for the pilot. “Sundance breakout Tyler Ross, star of indie Milkshake, and up-and-comer Izabela Vidovic have been cast as two of the four leads in Zombieland,” Deadline reports. Ross will play Columbus and Vidovic will play the charming Little Rock. The show will continue the adventures of the original foursome; Tallahassee and Wichita have yet to be cast. No word yet on whether Twinkies will be involved. Zombieland writers Rhett Reese and Paul Wernick penned the pilot and will executive produce alongside the original Zombieland producer, Gavin Polone. So, does this mean I have to become an Amazon Prime member in order to watch this? 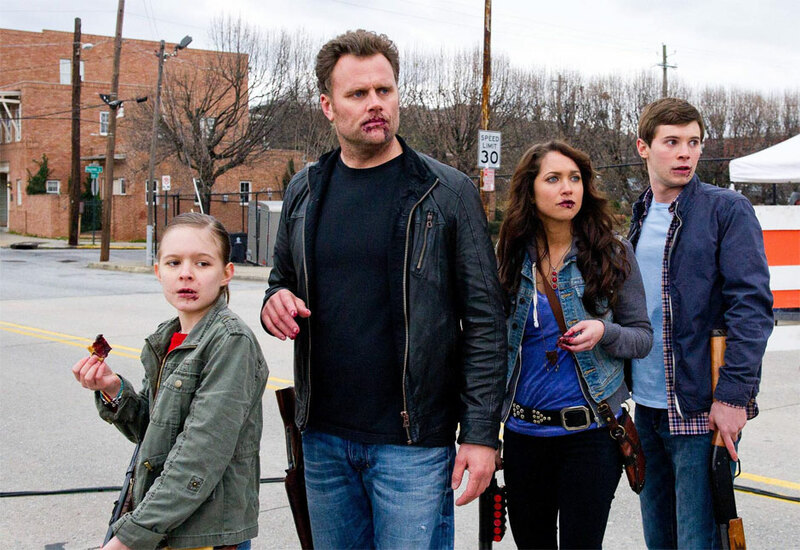 A Zombieland TV show has been in the works for years. The apocalyptic comedy was conceived of as a TV show before it ended up as a movie starring Woody Harrelson, Jesse Eisenberg, Emma Stone and Abigail Breslin, but after finding success on the big screen, talk once again turned to the small screen. That eventually turned into more than just talk; Amazon recently gave the pilot a green light, making it the online retailer/streaming provider's highest profile project to date. This new TV version of the show features the same four characters from the film, but they've been recast for obvious reasons. And now we've got our first look at the new gang. From left to right we have: Little Rock (Izabela Vidovic), Tallahassee (Kirk Ward), Wichita (Maiara Walsh) and Columbus (Tyler Ross). It's weird seeing them in place of the familiar foursome, but thankfully not everything about the show is changing. Original Zombieland writers Rhett Reese and Paul Wernick are returning to the show, and Tucker and Dale vs. Evil director Eli Craig is taking on the series' pilot. Both are very welcome pieces of news, especially the latter. Tucker and Dale is a new horror comedy gem, so it's nice to see Craig up to something new. In the not-too-distant future Amazon will be putting the pilot online for all to see, at which point they'll let viewers determine its fate. If people like it, they'll green light the full season. If they don't, we'll all just pretend this whole thing never happened. Looks interesting, but a little too "sitcom-y" for my taste. Zombieland will not be moving forward as an ongoing TV series. The adaptation of the hit movie was one of several pilots Amazon produced and then released simultaneously last month to viewers - with the decision on which to continue with to be made later, based on viewer reaction, among other factors. While the pilot didn't get great reviews, there was a lot of criticism from the get go from fans before production had even begun. Much of that criticism came from Reese and Wernick's decision to use the same characters they had created that we met in the film, memorably played by Woody Harrelson, Jesse Eisenberg, Emma Stone and Abigail Breslin. Reese and Wernick had always wanted Zombieland to be a TV series, which was how they first conceived of the project a decade ago, before being asked to rewrite it as a film. Reese left a series of tweets about Amazon not ordering the pilot to series, and made it clear he felt it was the fan reaction that led to the project being halted, saying it completely surprised him. Not at all surprised this got the axe. But I thought they had given it a full "season" commitment when this was announced. So does this confirm projects are worked on because an individual wants too? I'm sure projects are started based on a variety of reasons. But you would think on a weekly series type project of this degree would be put through some kind of survey? I could be wrong. Thinking further, I guess a lot of stuff on TV would not see light of day because 'audience' would not think it's a good idea. Thinking even further, maybe that's why there is a lot of crap on TV. It's like the old adage... Let fling poop against the wall and see what sticks.